Abrasive Waterjet Cutting with Intensifier Pumps-90,000psi. With the most comprehensive portfolio of Ultra High Pressure (UHP) abrasive waterjet cutting intensifier pumps, KMT Waterjet Systems offers the ideal water jet cutting technology for every waterjet machine – from occasional water jet cutting equipment needs to large format waterjet tables with multi-shift operation. KMT distinguishes between the PRO series for operating intensifier pump technology pressures of up to 90,000 PSI/6,200 bar and the abrasive water jet cutting pump models STREAMLINE® SL-V and JETLINE which operate in a maximum pressure range of 55,000 PSI/3,800 bar to approx. 60,000 PSI/4,137 bar. The advantages of the ultra high intensifier design operating pressure of 90,000 PSI/6,200 bar are particularly relevant for efficiency where operators need to water jet machine cut thick and/or very hard materials. The UHP operating pressure improves conformality as well as the quality of the water jet cut edge compared to traditional 60,000 PSI/4,137 bar applications. Depending on the material and its thickness, cutting with 90,000 PSI/6,200 bar allows waterjet cutting machine operators to increase the cutting speed by up to 50%. In some applications, the increase is even higher. Higher operating pressures improve the finishing product as well as the quality of the cut edge using any waterjet table. In many cases, there is no need for reworking cut edges. 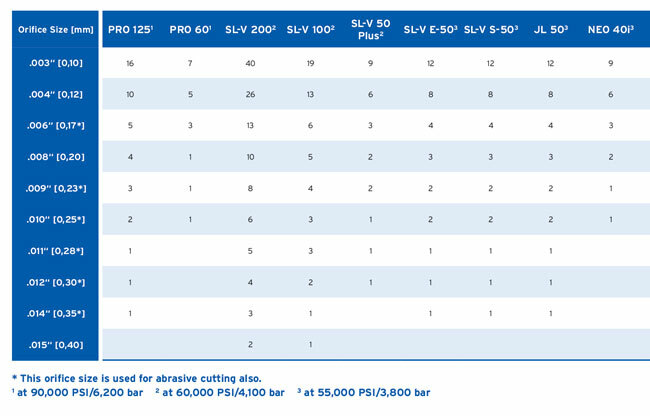 Cutting with 90,000 PSI/6,200 bar significantly reduces the consumption of abrasive. Thanks to the increased cutting speed, more workpieces can be cut in the same time. This leads to lower costs per piece. The high working pressure when piercing and cutting the workpiece reduces the delamination for composite material. Based on your material thickness, desired cutting speed and number of cutting nozzles, KMT has developed charts in the following 2 Steps to help in deciding which waterjet pump cutting system best fits your requirements. 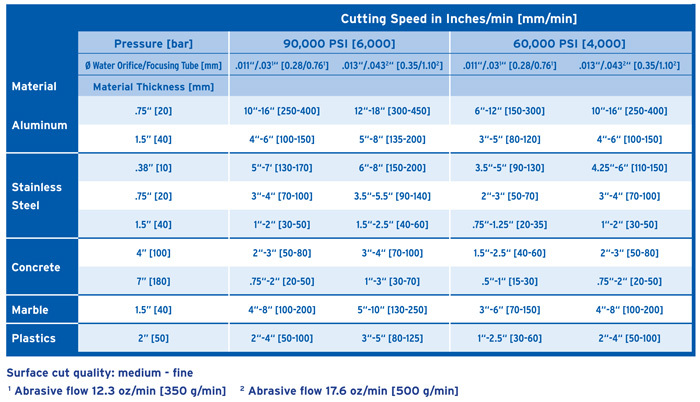 Step 1 – Determine the approximate Cutting Speed Rates required. By knowing the speed rate and estimating the orifice size range, a decision can be made on the number of cutting heads required. Step 2 – Determine, based on the orifice size and number of cutting heads, the size of the machine. The KMT high pressure pumps differ according to maximum pressure range and motor power which affects the water flow rate.